Now is a critical time for Contexts. We are quickly approaching the end of the 10-year plan the American Sociological Association (ASA) used to launch this operation back in 2000. We are happy to report that after the most recent ASA meetings, all indications are that the question is not whether Contexts will continue, but in what form and with what business model and publishing partner. With the economy still in the doldrums and print publications competing with a whole range of new media outlets and technologies, the challenges are many. However, we feel very good about what our team—including our national editorial board, our graduate student editorial board here at Minnesota, and contributing editors Deborah Carr, David Grazian, Doug Harper, and Laura Miller—has accomplished so far. We’ve held the line on quality and circulation at a time when most magazines and journals are slipping. We’ve also had several big media hits from recent issues. And thanks to the popularity of blogs like Sociological Images, ThickCulture, and our own Contexts Crawler, Contexts.org now logs more than half a million views a month. However, we won’t consider our tenure a success unless—or until—we get our material into the hands and heads of significantly more members of the public—regular folks as well as opinion leaders and policy-makers. It is time, in other words, to take Contexts to the next level. We know from your emails and inquiries that you are eager to see our office and ASA take swift, decisive steps toward making that happen. We promise we’re doing everything we can, and ask your continued assistance—by purchasing gift subscriptions for your friends, visiting and linking to Contexts.org, and sending us your own good ideas and writing. In the meantime, we hope this edition teaches you something you didn’t already know, be it about aging in America, sociology in a global world, the various considerations mothers and fathers must make to raise healthy kids, the war on terror, or an L.A. establishment that’s taking the taco truck to a new level. 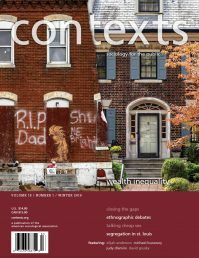 Most of all, we hope that after reading it you agree that Contexts is the most exciting way to bring sociology’s distinctive vision and voice to the lay public. Chris Uggen is Distinguished McKnight Professor and chair of the sociology department at the University of Minnesota. He studies crime, law, and deviance, especially how former prisoners manage to put their lives back together. Doug Hartmann is an Associate Professor of Sociology at the University of Minnesota. His research interests focus on race and ethnicity, multiculturalism, popular culture (including sports and religion), and contemporary American society.